Apart from water and air, it is food that the human race needs to survive. We can do without all the fancy gadgets for a day, but imagine having a day without food! World hunger is a pressing issue, which has many concerned because of the reducing agricultural land and exponentially increasing population. According to reports, 11% of the world population went hungry last year. This number has been an increase in the last 15 years. The bright side is that Agricultural technology is continuously evolving. There is an increased dependency on technology to increase efficiency of agriculture activities and reduce the cost. Why do we need AI in Agriculture? The population of the world will only further increase, land available for agriculture would reduce because of increasing urbanization,climate will further change and many more factors will lead to demand of increase in food production.With AI research progressing at a massive speed, it is obvious that researchers have have started to explore on how AI could help us resolve this problem of catering to the food needs of the world. The attempt is to use AI to cater to reduced labor, increase in crop harvest and efficient utilisation of resources such as soil, water etc. 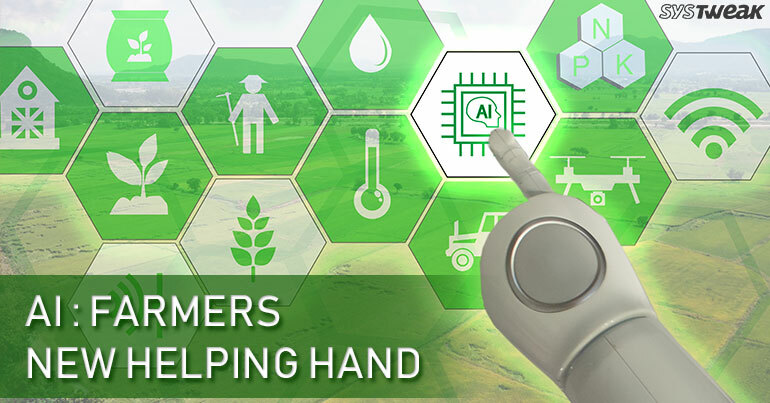 Let us look at some of the ways in which AI is offering a helping hand to our farmers or is expected to in the near future. This is the most common application of AI that most of us have been hearing about. Although still in its initial stages, it has already been adopted by many farmers across the Globe. As it suggests, the agricultural vehicles would not require manning anymore. They will be automatically handled by the AI. Increased automation will address the issue of reduced labour in near future because of most of them moving to city life. Driverless tractors, automatic milking, and strawberry pickers are some different applications of AI that are already in use! For now there are controllers, that is the people who handle the machine through remotes or tech platforms, however, it is soon expected to be handled completely by AI. 70% of world’s freshwater is used to water our crops. It is known that fresh water is going to be a key resource in the future and hence would need to be used efficiently. Automated irrigation systems, will be helpful in analysing the soil moisture and keeping it moist upto the right level. Irrigation is one of the most important step in crop growing and considerable amount of time and labour is spent in it. Depending upon the stage of growth, soil type, season and many other factors the water requirement is decided. All this would be taken care of by AI, which would consider all these factors, give accurate results and accordingly water the crops. Not only would that result in a good quality crop but also help conserve water. Agriculture is not as simple as it may seem. Crops are sown as per the weather, season, soil type, water availability and nutrients in the soil. Because of the increase in demand of food, farmers often go in for multiple crop or crop rotation, to increase the crop output, avail the nutrients for crop growth and let the soil replete its nutrients. AI with its cognitive ability can be used to decide which seeds are the best to sow or if hybrid seeds would fare better keeping. It will also consider the nutrient composition of soil and other factors. This would help in churning out efficient lot of crops. Increased demand for food with time will leave lesser scope for spoiled crop. Crop can get spoiled because of many reasons, some of which if identified in the initial stages can avoid losses at the time of harvest. This would save the crop, money, time, and increase the efficiency. AI technology is being enabled to identify any diseases in the crop. AI would use Image Recognition to make this possible. It will be assessing crop health on the basis of the data and images fed to AI to help it recognise the disease. Constant crop and soil monitoring will help weed out bad crop at earliest time possible. Drones are expected to be used for this purpose. While the demand in agriculture is high, the number of people moving from rural area to urban area is also increasing every year. According to reports by UN, by 2050, 66% of the world population would have moved to urban areas. This reflects on the obvious fact that the workforce required for agriculture would also decrease drastically. Which is where the technology enabled with cognitive ability will play a major role. Many processes will be automated and the need for manual labour will decrease. This will also upscale the agricultural skills. Some of them in their nascent stage, have already been applied in agricultural sector worldwide. However, there is still a long way to go. Amongst all the speculations about the downfall that AI can bring about for human existence, there still seems to be a silver lining in the cloud of AI aiding humanity! Beware of These Social Engineering Attacks!